Two days ago Steve Davis was sacked as manager of Leyton Orient but yesterday, in the same league, another ex-Claret Mark Yates was appointed manager of struggling Solihull Moors. Right now, they are bottom of the league with 11 points from their first 19 games, behind Torquay on goal difference and five points adrift of Barrow and Chester, the next two above them in the league. It’s been a difficult season for them. 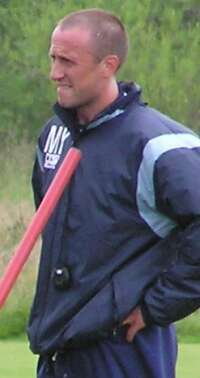 Previous manager Richard Money resigned at the end of October but he’d been in the job for less than a month having replaced Liam McDonald at the beginning of October. Yesterday, they confirmed the appointment of Yates, who started his coaching career at Burnley in 2004 and has since managed Kidderminster, Cheltenham and Crawley. He will be assisted by former Blackburn and England goalkeeper Tim Flowers. “Together they provide the depth of experience and enthusiasm necessary to give Solihull Moors the best chance of climbing the league,” said Simon Hawker, the director tasked with selecting the new manager. Yates, who left his last job at Crawley in April of last year, said: “This is an exciting appointment an it is great to be back doing what I do best. Tim and I know that we need points to turn the season around, starting at Maidstone which is going to be tough. That squad includes one player who has scored a Championship goal for Burnley. Following a return from America, where he played for Orlando City and Colorado, they have signed Sean St Ledger, who scored our second in a 3-2 win against Preston in October 2006. He made his debut just over a week ago in their FA Cup defeat against Wycombe.